Pain and tenderness on the inside of your knee, approximately 2 to 3 inches below the joint, are symptoms of pes anserine bursitis of the knee. 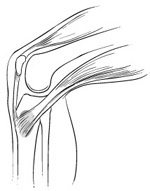 The pes anserine bursa is a small lubricating sac located between the shinbone (tibia) and three tendons of the hamstrings muscle at the inside of the knee. Bursitis, an inflammation of a bursa, usually develops as the result of overuse or constant friction and stress on the bursa. Pes anserine bursitis is common in athletes, particularly runners. 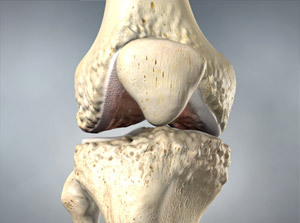 People with osteoarthritis of the knee are also susceptible. > Pain slowly developing on the inside of your knee and/or in the center of the shinbone, approximately 2 to 3 inches below the knee joint. 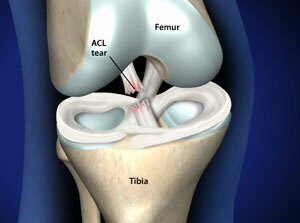 Your doctor will examine your knee and talk to you about your symptoms. Symptoms of pes anserine bursitis may mimic those of a stress fracture, so an x-ray is usually required for diagnosis. Rest. Discontinue the activity or substitute a different activity until the bursitis clears up. Ice. Apply ice at regular intervals three or four times a day for 20 minutes at a time. Anti-inflammatory medication. Aspirin, nonsteroidal anti-inflammatory medication(such as ibuprofen), or acetaminophen may ease the pain and reduce the inflammation. Injection. Your doctor may inject a solution of anesthetic and steroid into the bursa, which often provides prompt relief.